It is such a challenge to make something move vast distances and at the same time display a nicely framed work of art. I resolved this in the Pattern Box and The Cafe Wall Table by concealing the ends of the sliding strips within the piece. 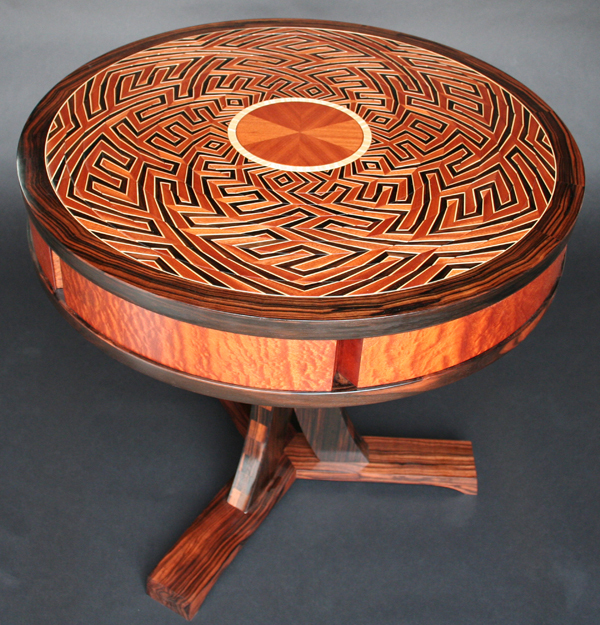 Translating the movements of the runners into circles resolves this issue beautifully and therefore allows the pattern to be the actual surface of the table. There is only one new challenge. Make everything circular! 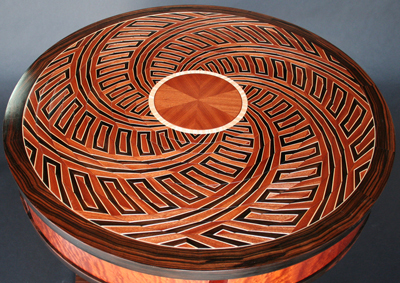 Only until recently have I discovered a proper technique for cutting such complex circles. The method is very interesting. It is more like the techniques I've used in the past making the Dodecahedron Box and Disc Box. 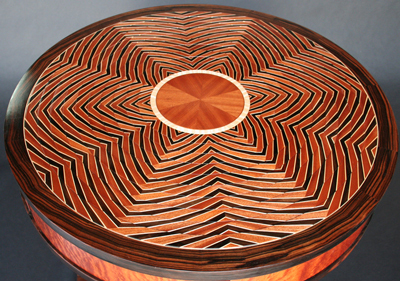 The Lotus Table top is composed of ten concentric rings of inlayed wood. Should you rotate these rings to the correct pattern one of the six surrounding drawers is unlocked. Inside each drawer is a clue for solving the next pattern to unlock further drawers. Should anyone open all six drawers a final secret compartment will be unlocked, the Coup de grâce! These pictures are only drawings for now. The orange wood about the sides and top is Pommele Sapele. It is one of the most beautiful woods I've ever seen. The lighter toned wood is a western quilted maple. It has a pink salmon hue to it. 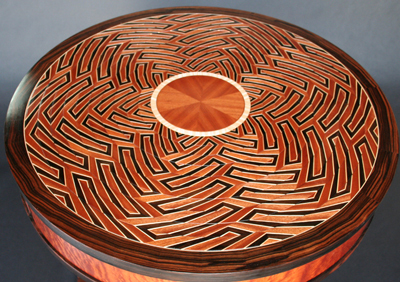 The dark wood is Macassar Ebony. I have some special boards of it that are entirely black. It is one of the darkest and hardest woods. Click here to see sale info. If you are interested please e-mail me. We can set up a payment schedule.